Few places in L.A. are as synonymous with the words “enchanting childhood memories” as the shop Flicka. Whereas businesses struggle for brand recognition, every parent knows the store as the place to find that special children’s outfit or unique baby gift. Passersby stop to check out the shop’s current ingenious window display theme—be it penguins or swimming pools. At birthday parties, moms spot the distinctive Flicka gift box on the present table. With its demure charm, coupled with its exceptional customer service, the shop attracts generations of customers thrilled with the experience of shopping in this friendly community boutique. 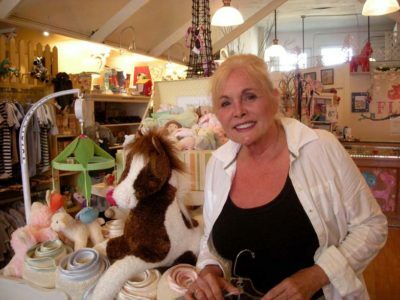 Owner Liz Reilly has contributed in defining Larchmont as a nostalgic neighborhood main street. Celebrating the store’s 20th year, Liz opened it when she was pregnant with her third daughter and unable to find the type of clothing she and her friends desired. Liz sold just little girl’s dresses. And so, the name Flicka, meaning “girl” in Liz’s native Swedish, was chosen. However, when customers soon requested infant clothing, she quickly expanded her inventory. Now the shop provides boy’s clothes up to size 7 and girl’s fashions up to size 16, as well as an array of toys. Liz’s responsiveness to her customers’ input accounts for much of her success. More hands-on than ever, the shop owner explains “I learn something new every day.” Trying to stock merchandise for every buyer “from the grandmother to the rock star,” Liz’s greatest delight is working with families; for instance, being able to find something that a young girl had her heart set on. “My happiest moments are seeing moms or dads lovingly interact with their children, teaching them proper behavior and social skills,” Liz says. Many of her early customers return years later with their own children. Liz shrugs off the inherent difficulties of owning a business in recessionary L.A., choosing instead to express her delight in being able to deal directly with the many local manufacturers and designers who furnish most of her stock. Always sensitive to her clients’ true needs (Liz keeps a customer note file), she understands the differences between east coast versus Southern California clothing requirements for children. “I love the street and I love the people,” she proclaims, anxious to see Larchmont Blvd. maintain its small town charm and economic vitality. Moving from Sweden as a seven-year-old, Liz and her actor husband John have resided in the neighborhood for 35 years. Her daughters have taken turns serving in the shop with the eldest now managing her own Cal Mart showroom, the middle one working with an artist, and the third, an actress, still employed at Flicka part-time. “A couple awaiting an adoption used to stop by, yearning for the day they could buy baby clothes”—one of Liz’s many fond memories. The delicate Flicka logo spelled out in twigs and nestled in the heart of the Village seems to evoke this same tenderness and Liz’s pleasure in being part of her customers’ lives and traditions. Flicka, 204 N. Larchmont Blvd. 323-466-5822.